Today, I noticed the new minty espresso dark chocolate covered coffee beans. It was 115 degrees outside and I wanted nothing more than to sample and enjoy just a few minty beans. I have a compulsion to check the labels of almost all food, so I checked and I was VERY happy to discover that I could, in fact, enjoy these!! Imagine my delight and joy. I was even able to have a sample in the store. Delicious is the first word that comes to mind, but it falls short of explaining how awesome these are. 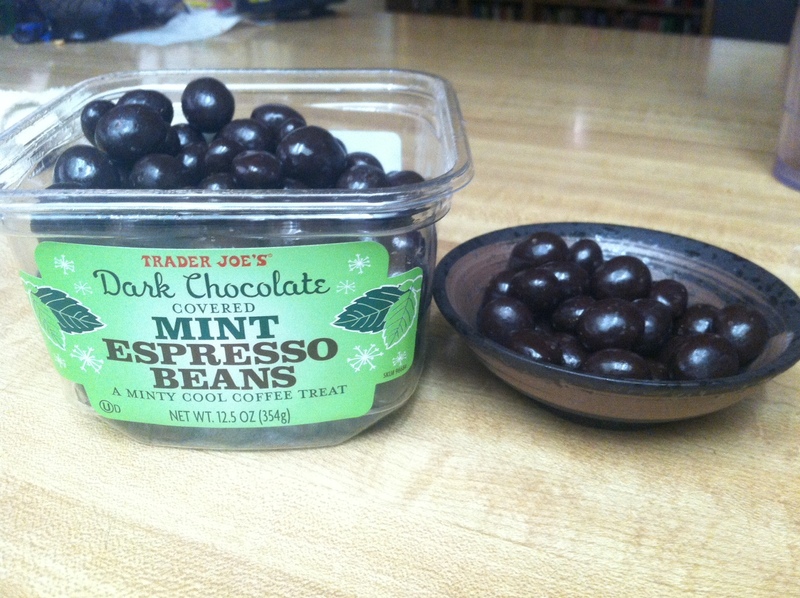 They have the complexity and non overt sweetness of dark chocolate, with a bright burst of refreshing mint. In the middle of it all is a small nugget of coffee bean you can crunch for a bit of texture and tannic, dark flavor. The only small drawback it the chocolate itself does have a slight waxy texture, but it is not horrible or overpowering. It is only there. If you are looking for a bright treat for these summer months, I recommend these. If you keep them in the refrigerator you can grab a bean or two for a low calorie dessert, or a little chocolate fix.